We each play a role in our relationship, right? I mean it wouldn't be a relationship if there weren't two people. So we each have habitual responses that we've learned over the years and some are good and some are bad. Most of the time the methods we learned to use in order to cope as a kid are what we still use as adults. If we didn't learn a healthy way to communicate and rely on others as a young person we may be struggling in our present relationships as well. Let's look at some of the ways couples interact with each other and the patterns these interactions take. Pursue/Withdraw: The most common cycle is a demanding spouse interacting with a withdrawing or distancing partner. In this pattern, the distancing or “stonewalling” position is a shutdown, non-response mode that often cues panic or aggression in the other partner as in, “I will make you respond to me.” Most negative patterns will be a variant of the basic pursue/withdraw pattern. When trying to identify the couple’s negative pattern, keep in mind that the positions are “default” options: they are what the partners do when they feel threatened or vulnerable. A male pursuer will tend to look different from a female pursuer. There is often a coercive element to a male pursuer. Withdraw/Withdraw: In this pattern both partners are hesitant to engage emotionally and, in the face of conflict, both will further withdraw. While this appears to be the couple’s basic pattern, it is more likely that a pursue/withdraw pattern underlies it. In these cases, the pursuer may be a “soft” pursuer who is hard to recognize because he or she does not show the overwhelming anxious energy seen in a lot of pursuers and who, despite being a pursuer, gives up easily. The other possibility, which is more common, involves a “burnt out” pursuer who has now given up reaching for the other partner. Withdrawal then can be the beginning of grieving and detaching from the relationship. Attack/Attack: Therapists often observe attack/attack sequences and escalations in couple interactions. Typically these escalations are deviations from a pursue/withdraw pattern where the withdrawer feeling provoked turns and fights, erupting in anger at specific moments. Here, after the fight, the withdrawer is likely to soon revert back to withdrawing until he or she feels provoked again. Complex Cycles: These often occur in trauma survivor couples where both anxiety and avoidance are high, resulting in more complicated sequences of interactions. An example would be: the husband makes coercive demands for compliance and attention, the wife withdraws, the husband escalates demands, the wife withdraws and then attacks in self-defense, both withdraw, the wife becomes depressed (for 3 days or so), the husband then pursuers, the wife slowly responds, the couple has a short period of loving sexuality, and the cycle begins again. Reactive Pursue/Withdraw Cycle: These cycles occur when a couple reverses a previous long-standing pattern. For example, a pursuing wife gradually gives up and limits her investment in the relationship. Her distancing, work-obsessed spouse does not notice. The children leave home - an important transition - and she announces she is leaving. 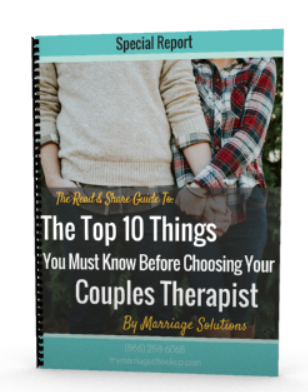 This couple then comes into therapy with a reactive cycle where the husband is now frantically pursuing to prevent a separation and the wife is cautious and withdrawn, refusing to commit to the relationship. The present negative cycle where the husband is now aggressively pursuing and the wife has give up is a reversal of their previous long-standing pattern of her pursuing and his withdrawing. What the Pursuer Wants: Their anxious pursuit and attacks are attempts at closing the distance they experience in the relationship and at the same time note the ways these reactions tend to drive away their withdrawing partner, providing evidence to the withdrawer that it is not safe to be close. What the Withdrawer Wants: The withdrawal of the more avoidant or ambivalent spouse is a response to help regulate the intensity of the emotional experience and calm the relationship down. The withdrawer’s expression of emotion is then blunted, leaving positive and negative affect reduced, which only tends to escalate the pursuer’s efforts to promote an emotional response from the withdrawer.